Salmon aquaculture has had its share of problems in the past, such as disease, sea lice, shock from sudden temperature changes and escapes into the wild. But Namgis First Nation Chief Bill Cranmer said his innovative closed-containment facility erase these problems. "It's completely isolated, you know we don't have to shoot any seals or sea lions that are trying to get at our fish. We don't put any contamination into the water, we don't have sea lice," Cranmer said. The fish are raised in fresh water which is recirculated. Fish waste is captured and can be composted. When new water is added the old water is treated in a manner similar to sewage. The Canadian aquaculture industry has been around for a little over 30 years. The Canadian Aquaculture Industry Alliance estimates the industry generates more than $2 billion annually and employs nearly 15,000 people from coastal and rural communities. 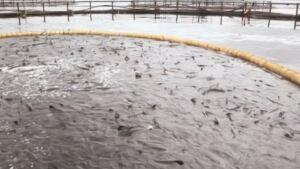 The Department of Agriculture, Aquaculture and Fisheries said aquaculture sales were worth $192 million in 2012 and the sector created about 1,150 jobs. Salmon represents 96.5 per cent of the province's aquaculture sales. 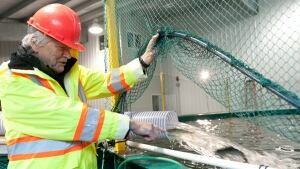 Steven Summerfelt, the director of aquaculture systems research at the Freshwater Institute in West Virginia and an adviser on the Namgis project, said they are raising and selling Atlantic Salmon 100 kilometres from the ocean. "We think we can produce fish anywhere," he said. "We have ideal conditions year round, we have ideal temperature, oxygen, the water quality is excellent, they get all the feed they want, there's no predators, no diseases." Summerfelt said the big seafood corporations are now looking hard at what they are doing. While there are large upfront costs to these operations, the salmon raised in the land-based facility are sought after by consumers. Cranmer said the salmon from his facility are fetching a 30-per-cent premium on the price because it is raised in a way that is environmentally sustainable.